Chemical Classification Software – Created by Hibiscus Plc as a joint development with Lexeus Ltd.
All suppliers of chemicals are legally required to comply with international regulations on chemical hazard communication. Responsible suppliers will also, of course, wish not only to comply with the basic letter of the law but to do this correctly and completely to ensure the safety of their customers and to present a professional image. Harmoneus 2 is an easy to use advice system based on asking straightforward questions about your product. It bases it’s assessment purely on the answers received and without making dangerous assumptions and so will always produce an accurate and reliable classification for your product whilst still requiring a minimum of effort. Harmoneus 2 bases its recommendations for a preparation on the specific properties of the preparation itself where that is appropriate. Alternatively, GHS regulations allow you to calculate health and environmental hazard classification for a preparation on the basis of information about its ingredients. The procedures for doing this are complicated and time-consuming but Harmoneus2 does the calculations for you and gives you the correct advice. ADR – the European agreement on transport of dangerous goods consistent with the United Nations Recommendations of the Transport of Dangerous Goods, Model Regulations, the International Maritime Dangerous Goods Code (IMDG Code), and the Regulations Concerning the International Carriage of Dangerous Goods by Rail (RID); REACH – the European regulations on Registration, Evaluation and Authorisation of Chemicals. More information for Harmoneus is available at Lexeus. Set up a database of frequently used ingredients so that you do not need to re-enter information about them each time you begin classification of a new preparation. The ingredients may be single substances but they can also themselves be mixtures. Archive classification data to keep a permanent record of how you decided on your classifications (this is a legal requirement). Create and save templates with stored answers to many of the questions to reduce the time and effort required when classifying similar products. 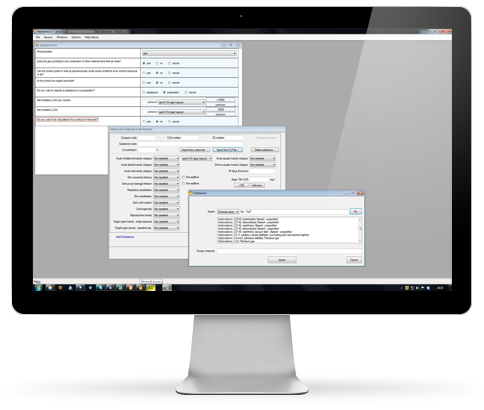 HibSoft Prometheus – to create safety data sheets. 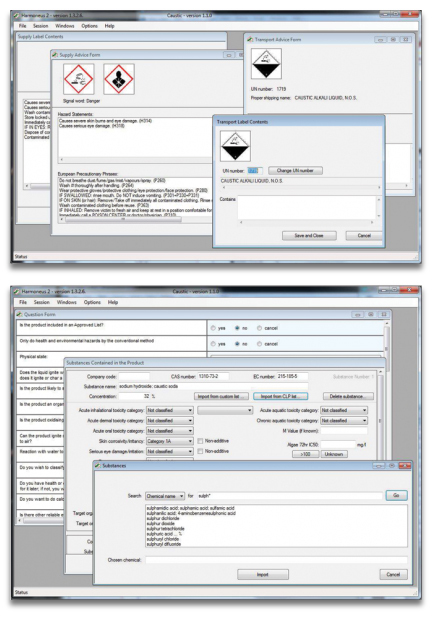 HibSoft Label Enterprise – to print hazardous chemical labels. Provides sound professional advice on chemical classification. Helps you comply with international regulations on chemical hazard communication. Makes it easy to produce a correct classification. Provides advice for safety data sheets and for GHS and ADR labelling. Saves you time and effort. Exports data directly to compatible safety data sheet and/or labelling software. Maintains a database of ingredients. Maintains an archive of classifications. Uses templates to reduce input. Storage: 200Mb free disk space. Memory: 4Gb (8Gb recommended for optimum performance). Processor: 2.0Ghz or faster (3.0Ghz recommended). Microsoft DotNet version 4.0 or higher (version 4.0 included).